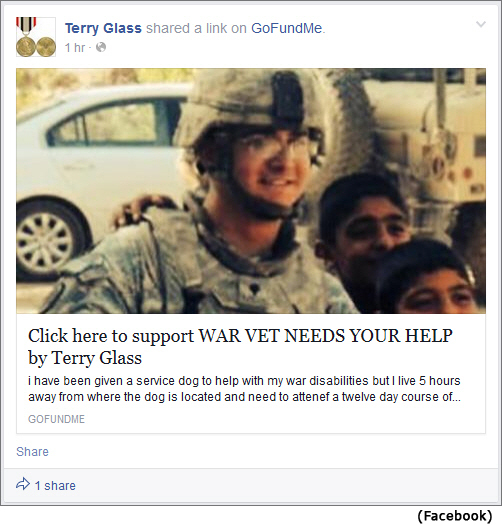 Terry Wayne Glass is familiar in some veteran Facebook circles for soliciting money via GoFundMe and GiveForward. 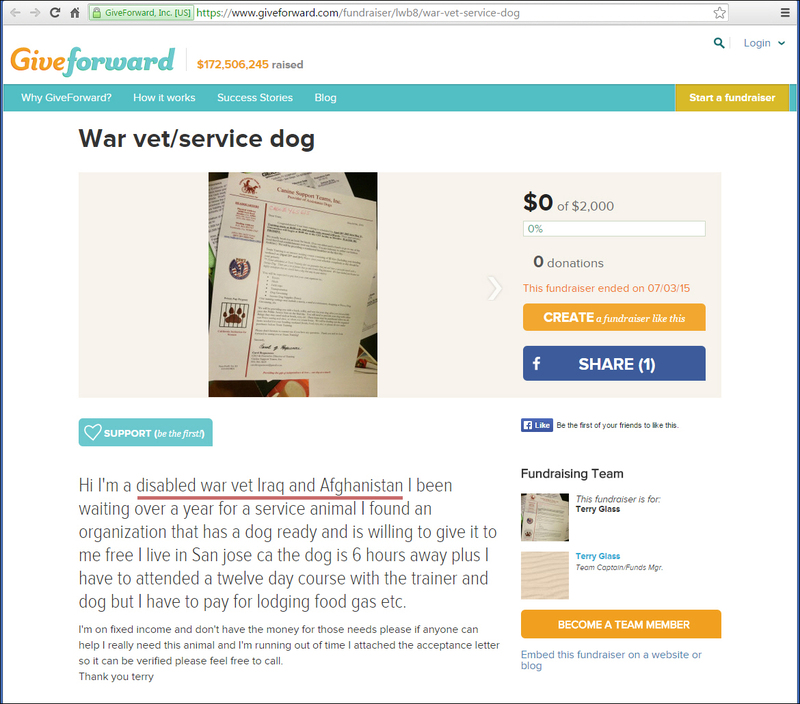 These solicitations usually involve touting military combat service as well as leveraging sympathy surrounding a predicament with a service dog – from expenses to obtain a service dog, expenses that goes toward food or vet bills for the dog, or the dog will die, or expenses to replace a service dog from one that was poisoned. Terry Glass’ early efforts on GoFundMe simply asked for money to pay electric bills but those posts were not met with a large number of donations. Later, the service dogs and the disabled combat veteran status became a frequent theme. 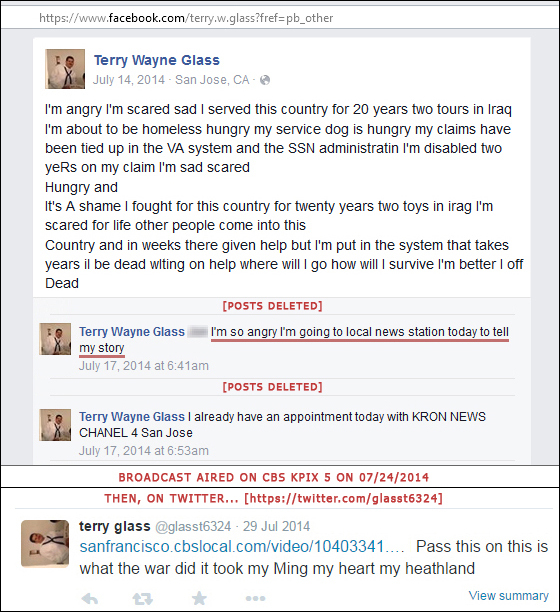 CBS KPIX Channel 5 in the San Francisco Bay Area did a news story on July 24, 2014 that featured Terry Glass. Allen Martin, the CBS KPIX 5 journalist/reporter, states that “after hearing from one Iraqi War vet suffering from Post Traumatic Stress Disorder, KPIX 5 was able to get him some badly needed appointments with VA doctors”. The newscast then went into the story of Terry Wayne Glass, showcasing his story as the Iraqi War veteran they were talking about. He served in the military for 20 years, 21 years, 23 years and 24 years. He returned to the [Persian] Gulf with a “tour in 2006“. 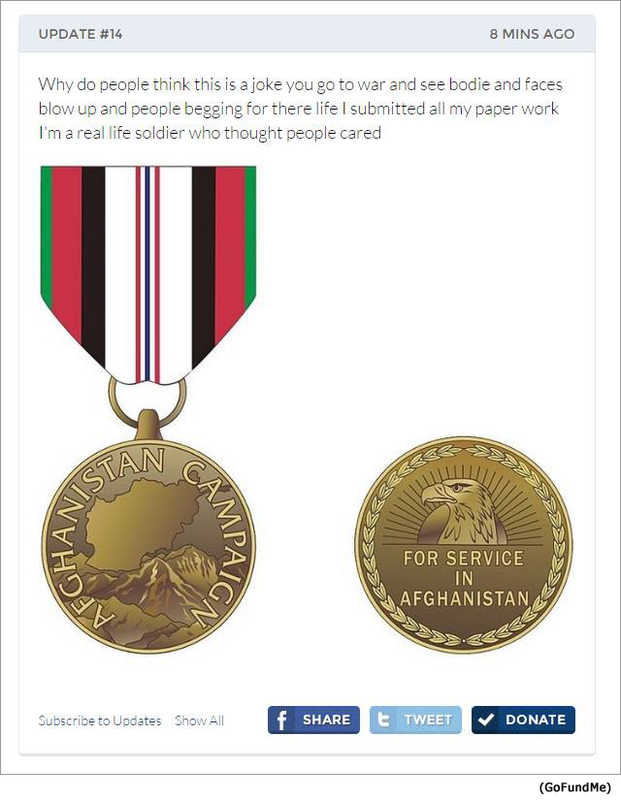 He saw “bodie[s] and faces blow[n] up” (posted with Afghan Campaign medal). He served two tours in Iraq. On another occasion claimed “two time Iraq Vet“. He is a “disabled war vet Iraq and Afghanistan“. He has “disabilities from Iraq and Afghanistan“. He has no money for food for either him or his dog. 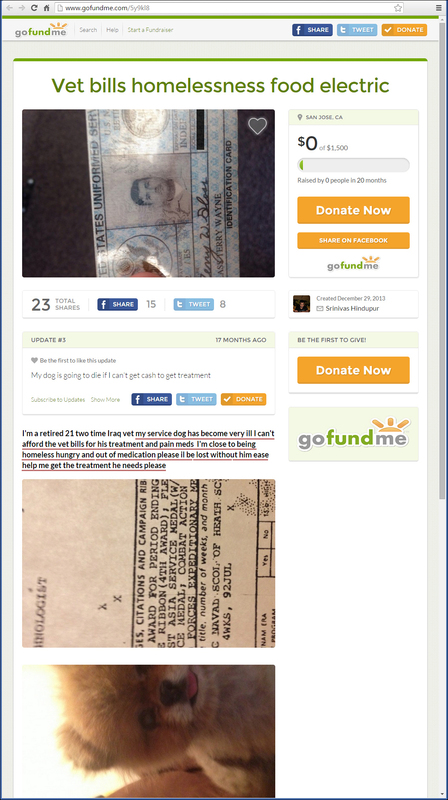 His “dog is going to die if I can’t get cash to get treatment“. His dog will die without money for food and veterinarian bills. 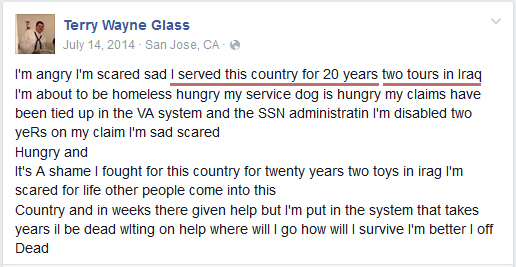 His service dog was poisoned and he needs money to get a new one. He needs money for travel and expenses to get a service dog. The official military records of Terry Glass show that he was not awarded the Purple Heart and there are no campaign ribbons for Iraq or Afghanistan. In fact, Glass was discharged on 31 October 1998. No other entries follow this. 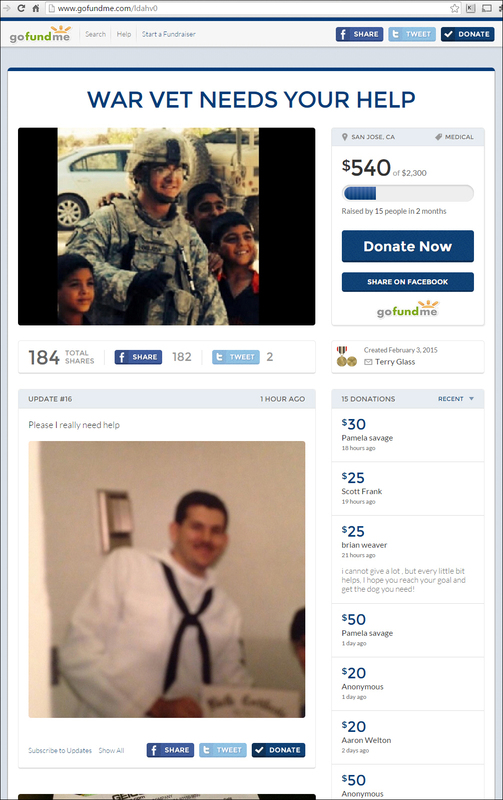 His combined total for active duty was just over 15 years, 3 months of active military service. 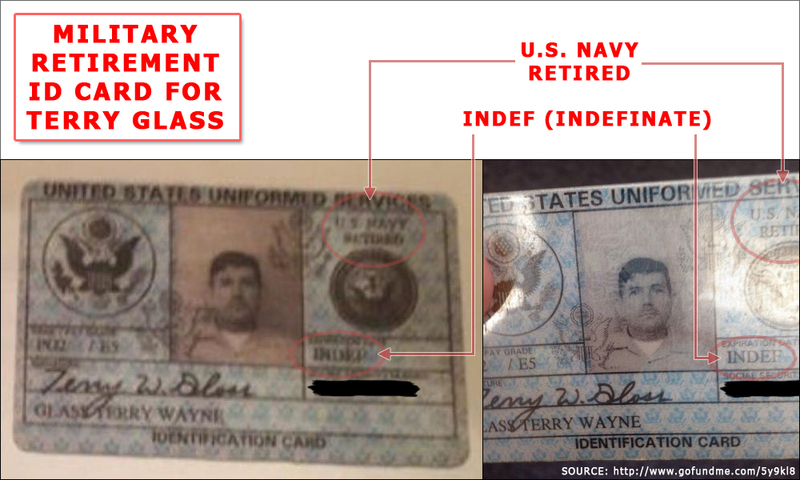 The military identification card of Terry Wayne Glass shows he is retired from the U.S. Navy. This could mean he retired after a career from active duty or medically retired. 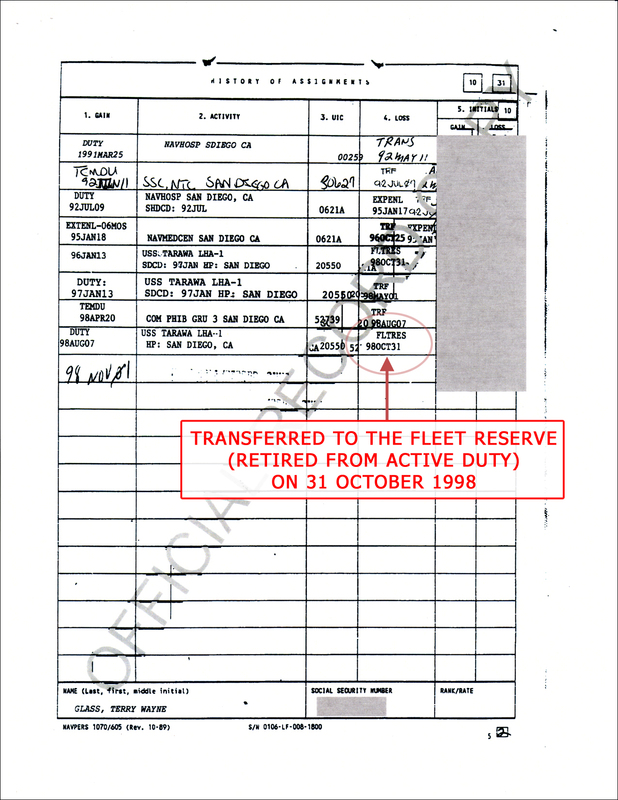 Considering the fifteen (15) years reflected on his DD-214 and other official military records, it either points to a medical retirement or early retirement. From 1993-2001, the Temporary Early Retirement Authority (TERA) authorized military members with over 15, but less than 20 years of total active duty service to apply for early retirement. The opportunity to retire under this TERA program ended in September 2002. If Glass retired under TERA, there is little likelihood that he would return to active duty. 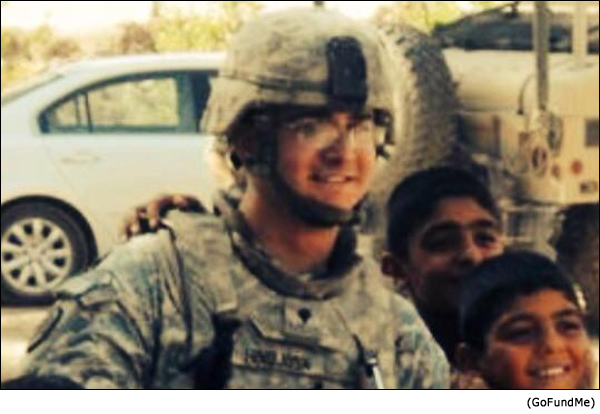 The likelihood of returning to active duty is even more remote if he were medically retired. As a medical retiree Glass would have to have obtained a medical clearance to either join the Reserves or get called back to active duty. Considering Glass’s claim of returning to the Persian Gulf in 2006, it could have meant as part of a reserve callup. This is speculating that he was either in the Active Reserves (drilling Reservist) or Inactive Reserves (not drilling but subject to recall). 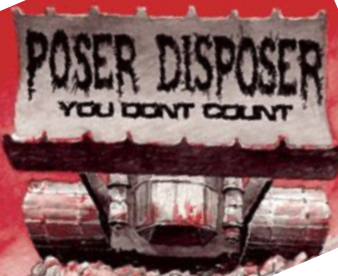 However, the DoD Manpower Database was searched systematically for each year beyond 1998 to the present year of 2015 and specifically in 2006 by monthly increments. Regardless, a search of 2007 would have shown anything in 2006. 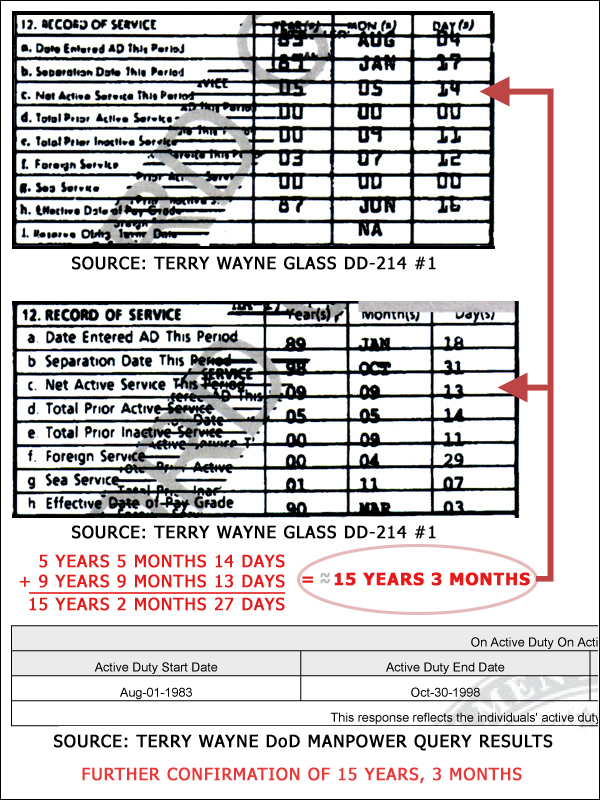 The DoD Manpower Database accounts for members with recalls stating that “The Member or His/Her Unit Was Notified of a Future Call-Up to Active Duty on Active Duty Status Date” and the query results note that “This response reflects whether the individual or his/her unit has received early notification to report for active duty”. 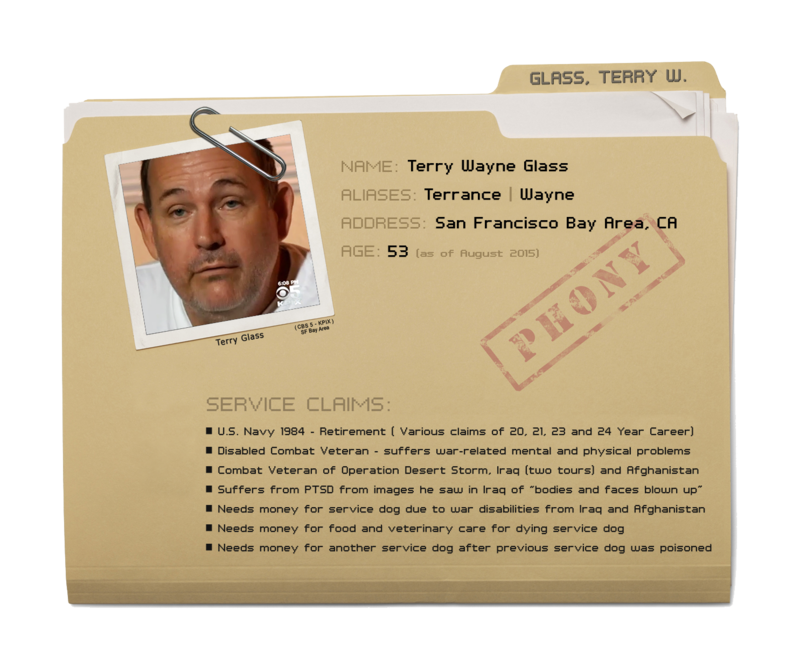 Although there is an extremely remote chance that the National Personnel Records Center and the DoD Manpower Database are missing a block of military service for Terry Glass beyond October 1998, this possibility is highly unlikely. 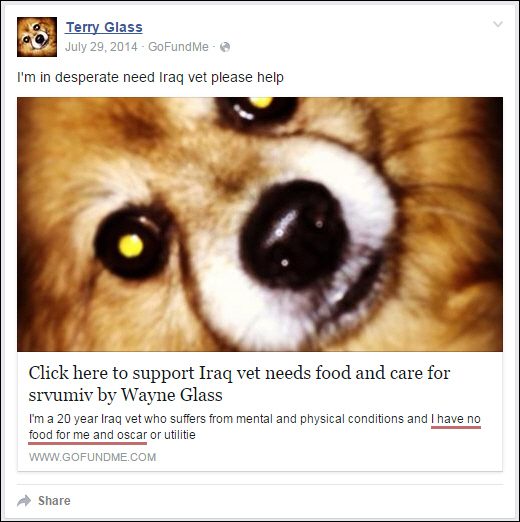 Therefore, the official military records of Terry Wayne Glass do not support his claims of doing two tours in the Iraq War, nor do they support his claim of serving in the War in Afghanistan. If he did not serve in either conflict then it can be logically concluded that he could not have suffered mental or physical wounds as a result of service in these conflicts. Glass has one (1) award of the Combat Action Ribbon (CAR) and this was most likely from the First Gulf War. If he was in Iraq for two tours, and also in the War in Afghanistan, why does he only have one CAR? Terry Glass’s official military records support him being in the First Gulf War, including his award of a Combat Action Ribbon (CAR). This is the most likely scenario. It is possible that Glass misspoke on many occasions on and off camera= and he meant that the mental and physical injuries he sustained were during the First Gulf War. Consider this possibility for a moment and let’s walk through that scenario. Glass was a Navy Hospital Corpsman that went through extensive training for 26 weeks at the Naval School of Health Sciences (NSHS) San Diego CA to become an Operating Room Tech (HM designation: 8483). Later, he was assigned to 1st Force Service Support Group on 12 AUG 1990 at Camp Pendleton CA prior to the start of the Gulf War. Being a Surgical Tech, he most likely would have been assigned to 1st Medical Battalion which has surgery as part of its mission. Glass would not have been assigned with a Marine Corps squad as a front line corpsman. The Navy tends to want a return on investment for all of the training they put into Surgery Tech or any other medical specialty. Therefore, if the story of the faceless man that was screaming is true it is more likely that Glass observed this during his time in the Operating Room vs. on the front lines. If images like this were disturbing, why would he subject himself to training as an Operating Room Tech or why didn’t he recognize early on that he may have chosen the wrong line of work? In fact, he appeared to continue with this line of work until he got out in late October of 1998. I am sure that memories stay with them, but how many surgeons or OR nurses claim PTSD from what they saw in the Operating Room? That would be an interesting statistic. During the First Gulf War (ODS), there were three Fleet Hospitals – 2 active duty and 1 reserve. None of the three were in Iraq as they would not have been that far north of Saudi Arabia and Kuwait. Two (2) Fleet Hospitals, Fleet Hospital 5 (Active Duty) and Fleet Hospital 15 (Reserve), were in the port city of Al-Jubayl, Saudi Arabia. The third, Fleet Hospital 6 (Active Duty), was in Bahrain. There would not have been a forward operating room located in Iraq and Glass was not a likely candidate to serve with a front line unit to put him as far north as Iraq. The conclusion is that the faceless, screaming man that Glass talked about seeing “in Iraq” is unlikely to be an experience he had from the First Gulf War due to locations. Glass himself stated that this event occurred during his “two tours” in Iraq. What is particularly egregious about this is that Terry Glass contacted the news media in order to float this story at a time that the VA was particularly vulnerable due to bad press. Glass seems to be artful in his choice of words, especially being a Hospital Corpsman. When he says that he is a “disabled war vet Iraq and Afghanistan“, or that he has “disabilities from Iraq and Afghanistan“, or that he is a “disabled combat corpsman I suffer from mental and physical problems due to war“, it implies combat wounded to a civilian untrained eye. His military records do not show the award of the Purple Heart, so his physical problems could as a worst case represent an injury, but can also be an ulcer from physical worry or nightmares. A military member could get hearing loss from working around jets on the flight line in a time of war and characterize that as “physical problems due to war”. Since he does not have a Purple Heart he was not wounded in combat. Having a Combat Action Ribbon (CAR) implies combat, but a military member can get a CAR for serving in a surgical hospital in the theater of operations and not necessarily the front line battle units. This statement is not meant to diminish this award for medical personnel, but as stated above, Glass most likely would have been employed in his specialty — a Surgical Technologist / Operating Room Technician (8483). Therefore, it can be concluded that his mental and physical problems were not the result of direct enemy fire. As stated above, the images that he saw were probably due to his time in the Operating Room, although in fairness this conclusion cannot be drawn with 100% certainty. There are just too many exceptions that would have to be applied to accept a scenario of mental and physical injuries as a result of enemy fire. When speaking of the faceless, screaming man, he says “a man” vs. his friend, buddy or colleague, so that also speaks to Glass not serving as a corpsman in a squad of Marines as he would have known the casualty. That said, it’s believed that Glass artfully chooses his words to imply injuries or wounds sustained in combat. Again, he never says “wounds” as that would most likely have to be supported by the award of the Purple Heart. It seems that Terry Glass contacted the news media to tell them his story. Since it appeared on CBS KPIX Channel 5 in San Francisco vs. KRON NEWS 4 in San Jose, it appears he may have contacted several channels. Due to bad press about the VA and its response time for veterans, the news media was receptive to the message that Glass brought to them. Did the news channel do any fact checking of Glass’s story before they ran with it? As the broadcaster stated, the story had leverage in getting Glass medical appointments with the VA. If Glass’s story proves false, was it fair for him to get head-of-the-line privileges over the other veterans that were also waiting in line for treatment? 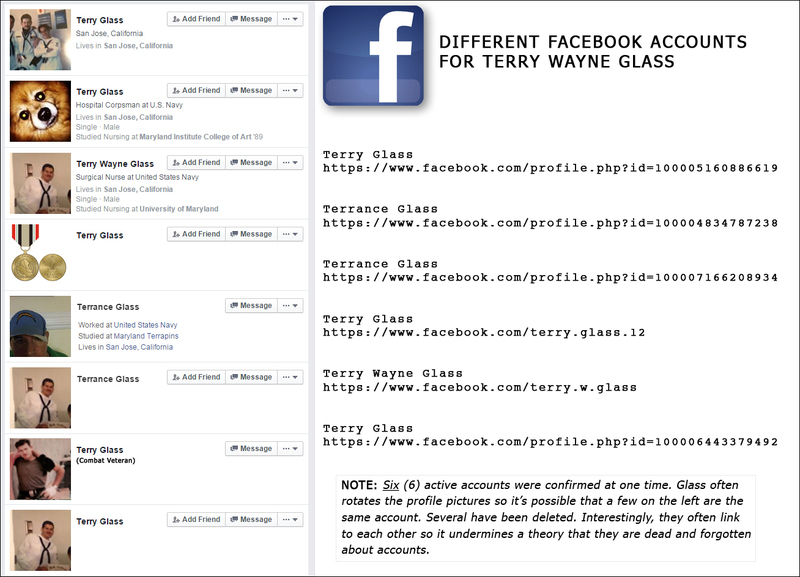 Glass maintains many Facebook accounts. They tie into each other and he often gives status updates that plead for donations that in turn link back to his GoFundMe accounts. He does the same with a Twitter account. Several have sent him money, food and toiletries, but that did not curb the pleas for help. One poster started to question Glass after sending him items and saw him continue to plea. It appears that the small breed of dog that Glass has is being referred to as a service dog. A PTSD dog cannot be simply a companion dog. There is a requirement for the dog to perform a specific service skill for the person. 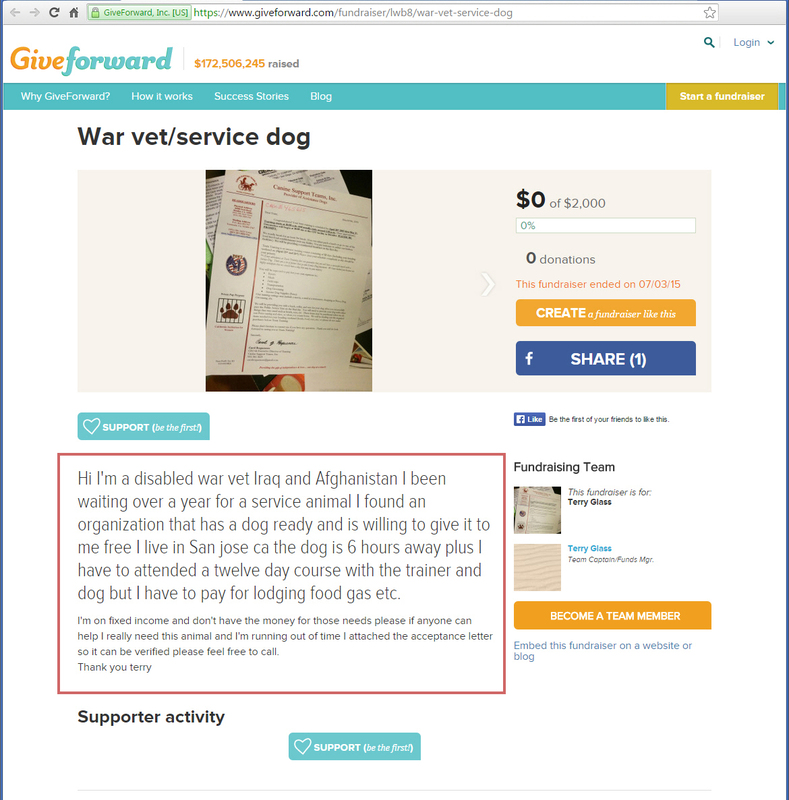 Carol Roquemore with Canine Support Teams, Inc. was contacted in this matter a few months ago. She said that Terry Glass is a verified veteran customer and the $6500.00 fee for the dog was waived because he was a veteran. He did inform her that he was using several methods, including GoFundMe, to raise the money to cover his 12 day training program with them. As stated above, the dog is not a companion dog but a dog skilled to perform certain activities. The man in the story above was convicted of fraud and is going to jail. Ask yourself what happens to the dog in these situations? 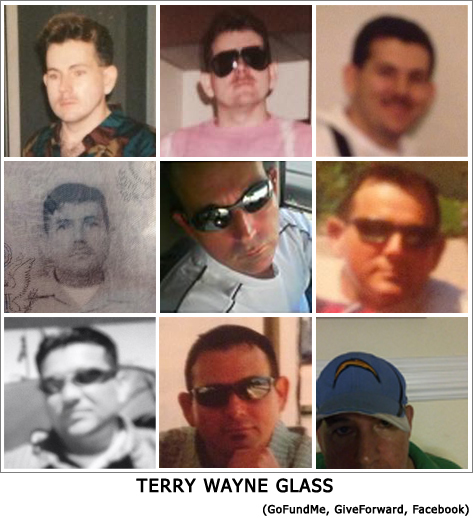 Terry Wayne Glass appears to only post photos of himself that are old, fuzzy, with sunglasses or obscured in some way. Glass will often post photos of someone that looks like him but is not. A larger version of the above photo revealed an Army uniform, Army rank insignia and a name tag. Although the name tag was hard to read, it clearly was not the name “Glass”. When Terry Glass was asked about this he said that it was an Army friend of his that was killed in Iraq. 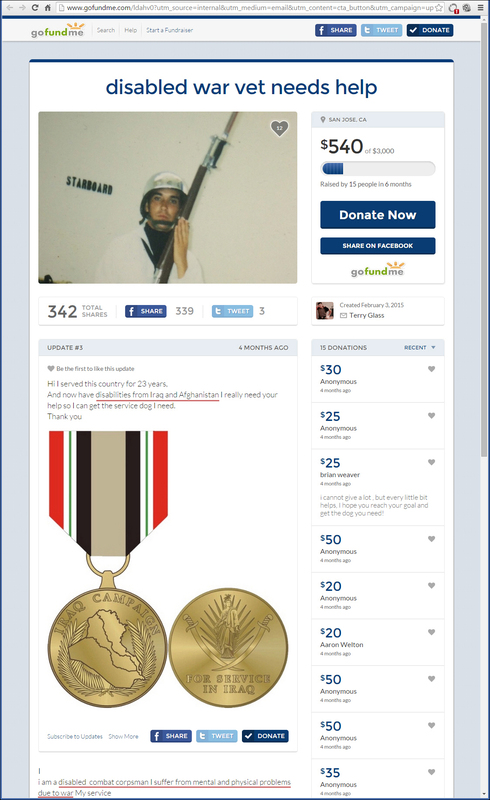 Glass then promptly removed the photo from the GoFundMe site after being asked about it. 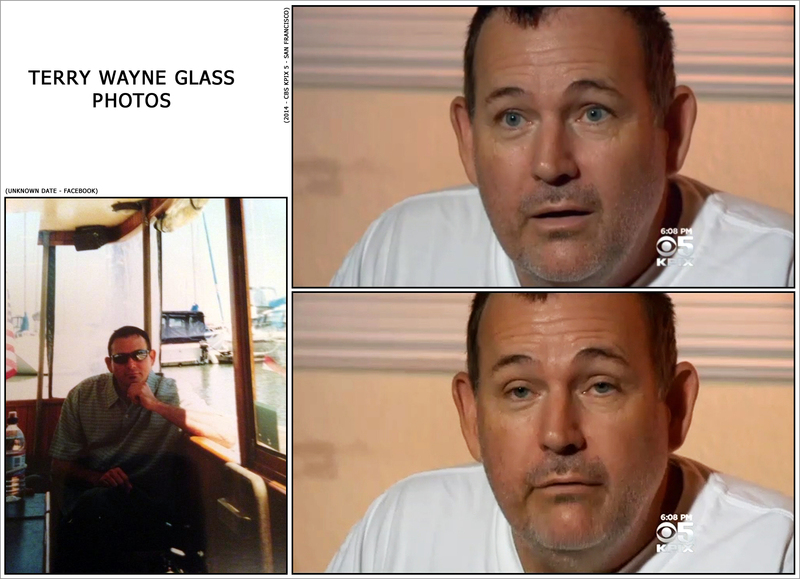 Here are photos confirmed to be Glass. 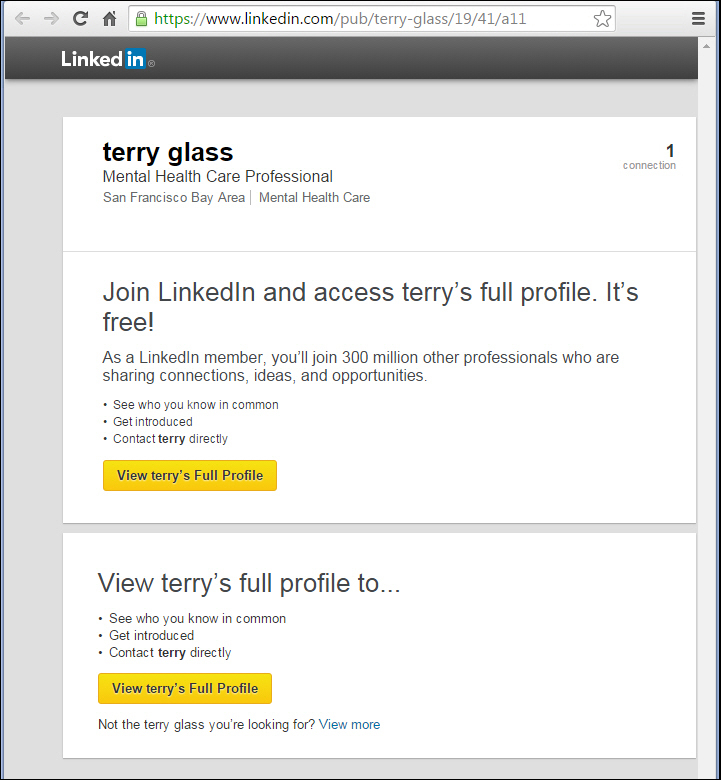 This Terry Glass is a scumbag. He never paid us back for helping him out. My husband a veteran is now battling cancer so Terry that is called disabled and the money you scammed us out of and your lies using your military card we could use that money. Paybacks are hell my friend. I know this is a late entrée. I believe he was probably on a AMPHIB attached to a surgical team to support the MUE. some of these ships crossed a certain LAT/LONG received the CAR for the ship being in danger. Ships have a certain criteria for receiving vice ground troops. The other thing that leads me to this is he has the South West Asia Medal with two bronze stars one for shield the other for storm. If he had been in ground combat with a Marine unit he would also have what is called Fleet Marine Force Combat Operations insignia. He does not have this just two small bronze stars and CAR. So he was in the rear or on a AMPHIB ship. I have no doubt he was in the service. I was in court with this guy for a year unbelievable what this guy can drum up and get away with using his military status. So sad. I found this page when wondering what some of my old pals were up to. This is a kick in the gut because Terry taught my OR Tech class at NHSD in ’93 and we all loved him. He was a great teacher who cared about his students and treated everyone with respect. WTF happened to the 4.0 sailor I used to know that made him fall to this? He was a good guy and that makes it all the harder to accept now. Straighten up, Glass. You’re better than this. If you only knew the real story it doesn’t matter any more. First of all I am disabled I am a combat veteran and I did serve in a war zone you all think you know my story but you don’t. You will never understand it! I’m a proud combat veteran of this country and those of you that don’t suffer from my issues will never understand so I won’t even try to explain. It’s a shame you would tell me that I didn’t serve this country and also that I’m a military phony a military phony is someone that is not a Veteran so get your stories straight before trying to ruin someone’s life who served and retired and is combat related veteran! You need to come clean Mr. Glass and pay the people back you scammed using your so called disability.I have never met anyone who can lie and make up stories like you.Your a discrace scamming old people out of money to help a veteran. 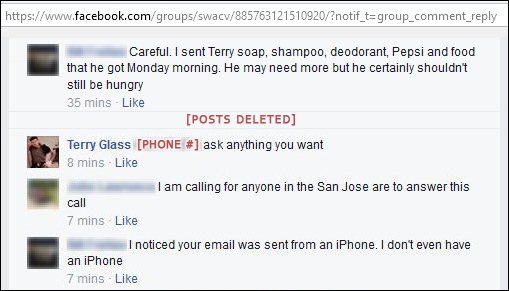 Terry, that comment just clarifies to others what kind of person you really are. 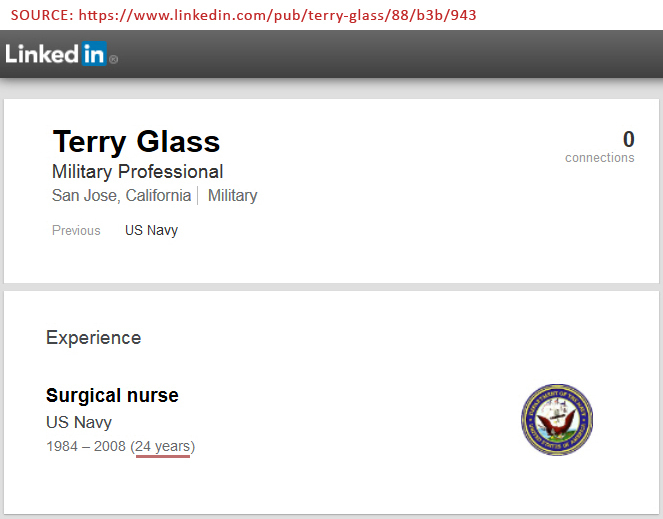 I am like Vietnam combat veteran, I have a 100% rating, This Terry glass is a phony.